Dr. Bruce Lee Haines, a valued colleague and friend, passed away on 16 February 2007 in Athens, Georgia. Bruce was a dedicated teacher and researcher in ecosystem ecology. 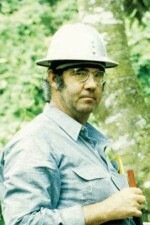 His research interests in sulfur input-output budgets in watersheds and entire countries, as well as sustainable land use, took him to numerous tropical sites, including Costa Rica, Panama, Puerto Rico (Luquillo LTER), Venezuela, and the forests and watersheds of the Coweeta Hydrologic Laboratory (Coweeta LTER) in western North Carolina. Bruce was born in Long Beach, California on 26 April 1941. He lived with his botanist parents Lee and Katherine Haines and sisters in Topanga Canyon, California. Bruce came by his interests in the tropics very early. His parents took the family on several field trips down the Inter-American Highway, camping along the way and botanizing in several countries in Central and South America. A bromeliad discovered by Bruce and his father on one of these trips was named Vriesea hainesiorum. Bruce attended high school in suburban Los Angeles, obtained his B.A. degree in 1964 and his M.A. in Botany with Cornelius Muller at the University of California, Santa Barbara in 1966, and went on to obtain a Ph.D. degree with Dwight Billings in the Botany Department at Duke University in 1970. After four years as a junior faculty member at Illinois State University, Bruce joined the Botany Department (now Plant Biology) at the University of Georgia as a Research Associate and worked on research projects at the Savannah River Ecology Laboratory and at the Coweeta Hydrologic Laboratory under the tutelage of Drs. Carl Monk and Dac Crossley. Bruce moved from Instructor to Associate Professor in Plant Biology during his tenure at the University of Georgia. Bruce had an offbeat sense of humor. He was indefatigable in his research and his quest to find out how ecosystems work. He mentored generations of graduate students, over 23 at last count. He taught courses that were designed to make students question any and all concepts, particularly in his recent course on The Rise and Fall of Civilizations, in which he noted the effects of lack of renewable resources on their failures in sustainability. His Nutrient Cycling in Ecosystems course was a "must" for many students in the Institute of Ecology. Bruce's enthusiasm for ecology enthralled many students. His lunchtime discussions outside the UGA Creamery were lively and attracted a diverse group of students and colleagues. He was exceedingly generous (with time, money, and attention) with graduate students whom he deemed worthy of encouraging. The research costs of several students were supported primarily on Bruce's checkbook rather than on any research grants. In 1990, Bruce introduced one of us (Coleman) to tropical ecology in a memorable 2-week transit across field sites in Costa Rica. We went from La Selva in the Atlantic Coast lowlands to the highland cloud forests and the dry forests of Guanacaste province on the Pacific side. Bruce was truly in his element out in the field, moving his tall 6 foot 5 inch frame across the landscape in all weather regimes, covering long distances along trails or on no trails at all, wherever his curiosity and interests took him. It was an education in itself to participate with Bruce in his massive measuring and sampling efforts during his long-term studies of leaf-cutting ants at La Selva Biological Station. More recently, he measured long-term recolonization of formerly agricultural fields in areas near the Las Cruces Biological Station near Coto Brus in southern Costa Rica, with his colleague Chris Peterson on an NSF-funded grant. Bruce published over 60 papers in refereed journals. Bruce will be greatly missed by his colleagues and students throughout the United States and the Neotropics. Reprinted with kind permission from the Ecological Society of America Bulletin.